In Lexia's 3-step personalized learning model students are motivated by their own success and have their own personalized learning paths, student performance data is easy to access and simple to interpret, and teachers have the resources they need for face-to-face instruction and independent student practice. Explore each part of Lexia's personalized learning model below. Students work independently to develop critical reading and language skills through individualized, motivating learning paths. All students, regardless of their skill level, can each work at their own pace and the teacher is notified (on web-based reports and via email) only when they require support. As students work independently in the online activities of Lexia's instructional programs, real-time performance data is collected through Lexia’s patented embedded assessment tool, Assessment Without Testing®. Here, educators can access data reports online through their myLexia accounts on a browser, iPad app, or iPhone app. Teachers have the resources they need for face-to-face instruction and independent student practice. Based on the embedded student assessment data, Lexia recommends specific resources for individual and group instruction that fit flexibly into existing classroom routines. Lexia helps students work independently to develop their critical reading skills through individualized, motivating learning paths. All students, regardless of their skill level, can each work at their own pace and the teacher is notified (on web-based reports and via email) when they require support. Students have the opportunity to accelerate beyond their grade-level skills, as they are given the ability to demonstrate proficiency in each skill area, and are advanced to the next level in the program if no instruction is needed. For students in need of extra support, Lexia provides a level of scaffolding. If the student still struggles, the program provides explicit instruction on the concepts and rules of the skill, allowing the student to demonstrate proficiency and then return to the scaffolded level and standard-level activities. Personalized instruction ensures that students receive the appropriate intensity and support to acquire the skills they need to become proficient readers. As elementary students move through the levels of the program, they are engaged and motivated by activities that take students on a journey around the world. Each level of the program represents a different area of the world and introduces new characters that are representative of each region. Within each level, students have the opportunity to decide which skills and activities they want to work on. This allows the students to be self-directed in their learning as they move through the program and their journey around the world. For students in grades 6–12, Lexia provides a more age-appropriate interface and allows students to progress independently to higher levels with more complex content based on skill mastery. Since students' learning within the program is self-directed, they can choose which activities to complete as they work through the rigorous scope and sequence. Motivation for adolescents who may have difficulties with reading is critical, and research suggests that students are more motivated when they are able to monitor their own progress. To support motivation, students are able to view their progress on a personalized dashboard. As students work independently in the online activities of Lexia's instructional programs, real-time performance data is collected through Lexia’s patented embedded assessment tool, Assessment Without Testing®. Here, educators can access data reports online through their myLexia® accounts on a browser, iPad app, or iPhone app. Within the myLexia reports, a data-driven action plan is provided to take the guesswork out of differentiating instruction. These reports helps focus the teacher’s time on the greatest need by prescribing the instructional intensity necessary to help students reach end-of-year benchmarks. The action plan identifies the skill areas in which the student is currently working, specific skills with which student needs instruction, the program usage based on the student’s recommended minutes in the program, and completed levels. Lexia automatically group students by skill for small-group instruction using color-coded icons based on risk level. This helps educators plan their days by prioritizing the students who need the most help. The programs also provide structured, skill-specific instructional materials that provide scripted, step-by-step strategies for teachers or paraprofessionals to address each student’s skill gaps. These lessons can be used for both individual and small-group instruction including pull-out groups with intervention specialists. Once the student receives a lesson, they may be ready to return to the independent, online activities and continue in the program or they may need additional support. Lexia Lessons are scripted materials that allow teachers to provide explicit, multi-sensory instruction in specific skill areas. Lexia Lessons are automatically recommended for students who are struggling based on their performance in the online activities and can be delivered in a variety of ways, such as individual or small-group instruction within the classroom or during pull-out intervention with a specialist. When a student successfully completes an online activity in Lexia's instructional programs, a set of paper-and-pencil activities are provided to reinforce and extend the learning. Lexia Skill Builders can be incorporated into classroom routines or used for home practice to build independence, increase automaticity, and expand expressive skills. Lexia Instructional Connections provide teaching strategies and collaborative activity ideas to use with all students as a way to introduce, reinforce, or extend skills. These innovative classroom ideas can help teachers structure individual and group activities that integrate speaking, listening, reading, and writing. 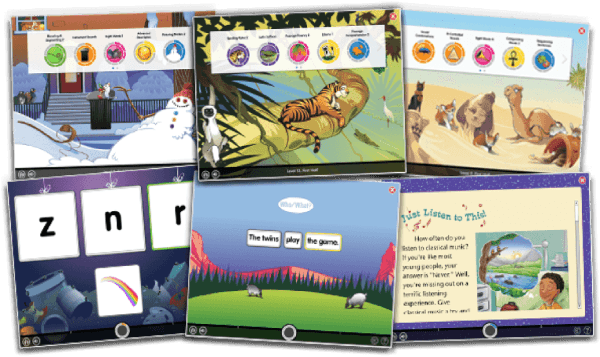 Lexia Instructional Materials fit flexibly into existing classroom routines. While some students work on tablets or classroom computers to complete online activities, the teacher can provide direct instruction using Lexia Lessons to one group of students. While this takes place, another group may be collaborating on an activity suggested in Lexia Instructional Connections or practicing skills using Lexia Skill Builders. Working independently helps on-target students develop automaticity and expand skills and allows teachers the opportunity to provide direct, face-to-face instruction for students at the greatest risk of reading failure. Preview 7 levels of the student program. Each of these levels give you access to various activities that provide personalized learning in the SIX areas of reading.